Bosch Dishwasher Beeping – How To Turn Off Alarm Sound? 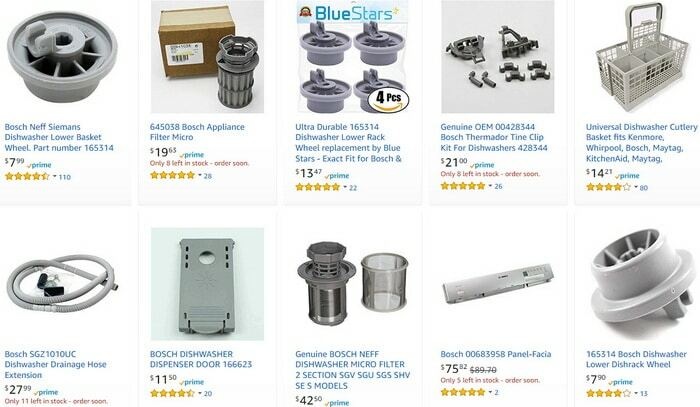 How To Disable Bosch Dishwasher Alarm? My Bosch dishwasher keeps beeping after cycle. 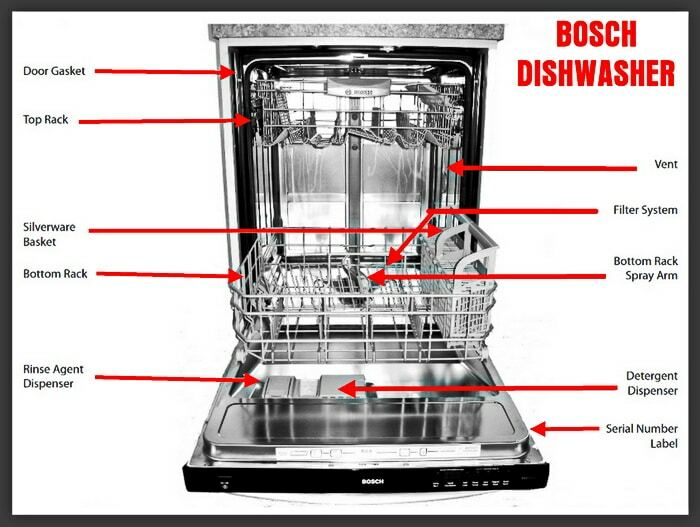 Bosch dishwashers on the market today have an alarm sound that beeps and alerts you that the cycle is completed. The default setting on most Bosch dishwashers is set for the alarm to be as loud as possible. This beeping is to let you know the washing cycle is done. However it is usually set from the factory to the loudest setting possible. Many people have asked us how to either stop the alarm from beeping or to set it to a lower audible tone. Here is how to either turn the alarm sound off or to turn the alarm sound down. -The cycle completion signal alerts you when a cycle completes and the dishwasher has washed and dried the dishes. -You can choose to disable the tone or adjust the volume. 1. To activate: Press and hold the right “CANCEL RESET” button then press and hold the ON/OFF button. 2. When the light on the “CANCEL RESET” button you are pressing illuminates and the tone goes off, release both buttons. 3. Press the far right “CANCEL RESET” button until you achieve the desired volume or until there is no tone (to turn off). 4. Press the “ON/OFF” button. 5. The setting is now saved. 1. If your Bosch dishwasher has the hidden control panel, open the door to access control panel. 2. Press the “ON/OFF” button and the “NORMAL WASH” button at the same time on the control panel. 3. Now press the “START” button until the control panel displays the code “H:00”. 4. Let go of both the “ON/OFF” button and the “NORMAL WASH” buttons. 5. Press “NORMAL WASH” button and the display will show the code “b:02”. 7. Press “START” button to save the new setting and close dishwasher door. 1. Open the dishwasher door. 2. Push and hold the “DELICATE/ECONO” button. 3. Turn the dishwasher on while holding “DELICATE/ECONO” button. 4. Release the “DELICATE/ECONO” button. 5. If the control button beeps the end of cycle alarm tone is ON. 6. Press the “DELICATE/ECONO” button to disable the alarm tone. 7. If the control button does not beep after the “DELICATE/ECONO” button is pressed, then the tone is turned off. 8. Turn the dishwasher off to save the setting. 1. Hold the “POWER” button and the “DELAY START” button down at the same time. 2. When done properly you can choose between a 0, 1, or 2. 3. The numbers 0, 1, or 2, is the audible tone adjustment numbers. 4. Press the button until the number is at “0” as this sets the alarm to off. 5. Press “POWER” button to save. 1. 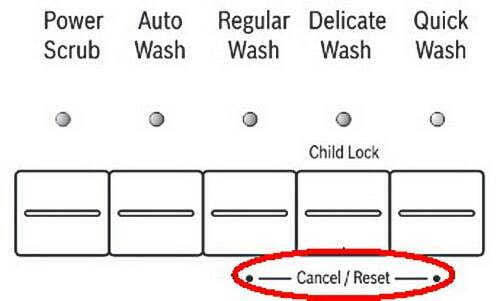 The Bosch dishwasher control panel has a label called “CANCEL RESET”, there are 3 buttons under this label (see illustrations below). 2. Press and hold the very “RIGHT” button under “CANCEL RESET” label, and the “ON/OFF” button at the same time. 3. Hold the buttons until the light illuminates on the “CANCEL RESET” button and the adjustment sound will stop. 4. Once this happens, release both of the buttons. 5. Then press the “RIGHT” “CANCEL RESET” button to make the alarm tone louder or softer then the adjustment sound will turn off. 6. To save the setting press the “ON/OFF” button. NOTE: Turn off alarm method works on Bosch Dishwashers Model SHE9ER55UC, SHX3AR75UC, SHX46A02UC/30 and more. 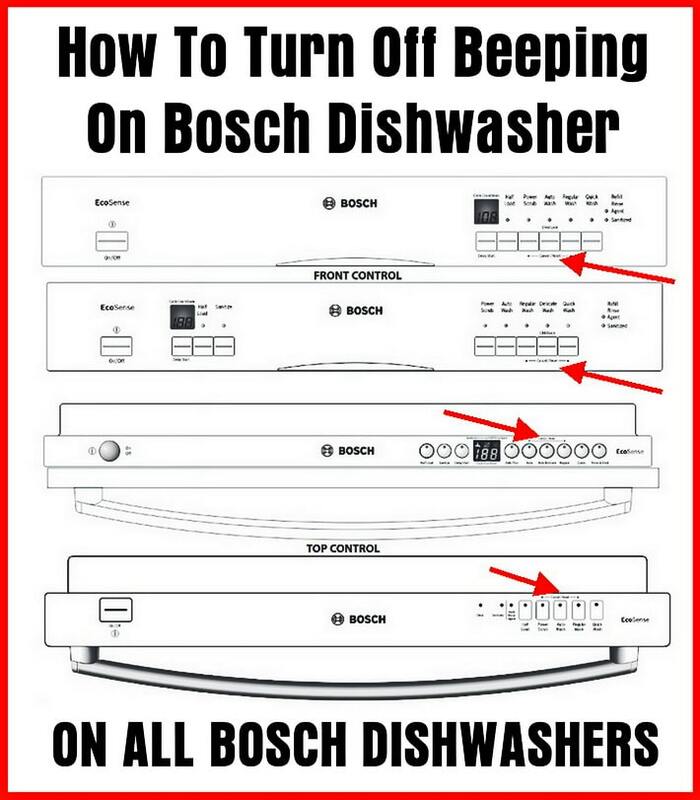 Do you need help turning the alarm off on your Bosch dishwasher? Please leave a comment below including your Bosch model number so we can assist further. ARRRRGH. that ANNOYING “cycle completion sound” on a 2018 BOSCH Dishwasher SHX3AR72UC. The Silence Plus 50dBa models. The ****AR27 model does NOT have a cancel reset button. There is no display. There is a “Start” ( reset) button on the far right with the words “reset 3 seconds” under it. Any way of turning this end cycle sound OFF? nailed it! (on a SMV53L80EU model) power on the device, hold the “Start”/reset 3 secs and ECO buton, and a code should be displayed. For me, it was H05 (have no idea what this is, so I let it be). To browse in this “hidden” menu, use Eco button only. To change values for the beeping (my model was having the B03), use the + or – from the delay menu, and the value displayed will change accordingly. Also, you will hear the sound decreasing if you press on the -, so I think this is more than enough to decide if you want to reduce the sound or mute it completely. Hope it works for you as well. Mon lave vaisselle est un bosch modèle SHS5AV55U. Je ne suis pas capable d’arrêter le bip pour m’indiquer que le lavage est terminé. S.v.p aidez- moi. Press the > button, the “Clean”, “Sanitized”, and “Add Rinse Aid” LED’s are all blinking. Press start to save setting. Is there a way to turn off the beeping on model SHS5AV55UC/22? It does not have a cancel/reset button, a normal wash button, delicate button etc. Nor does it have a display. Please tell me there is a way to turn off this insane noise. 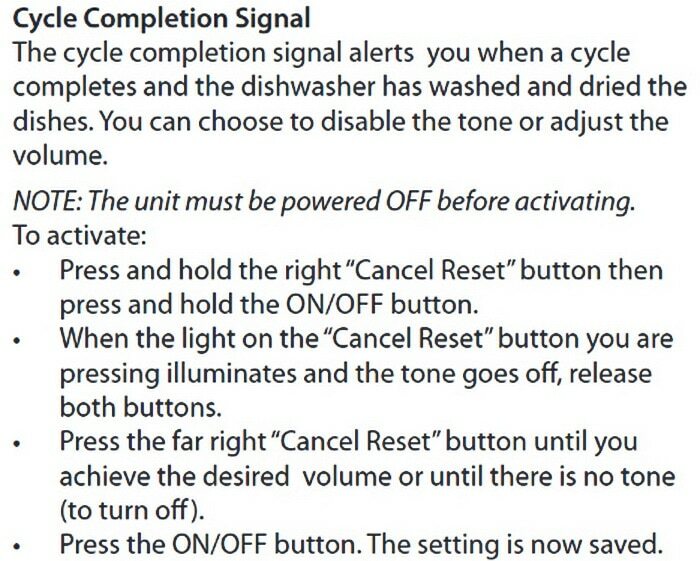 I have a new Bosch SHEM78W52 dishwasher and the instructions in the product manual to disable/silence the end of cycle signal/beep do not work. The front control panel is different from any of the models you have described above. Do you know how to silence the signal on this model?